With my eBay auction of a super book, "The World Chess Championship 1951", about to finish, it's a good opportunity to talk again about David Bronstein, who tied that 1951 match with Mikhail Botvinnik. 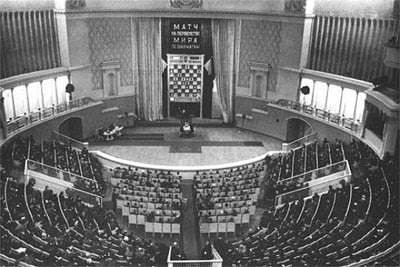 Full of enthusiasm, Bronstein was a great tactician who played adventurous attacking chess. He had deep views about the game and contributed some of our finest chess literature. He was responsible for re-introducing the King's Gambit to top level play, but the opening he will always be most associated with is the King's Indian, where he contributed not only tactical, but also a wealth of new positional and strategic ideas. After 11 f3 Black would get an excellent game with 11 ... c6 and 12 ... d5! Also bad is 11 Qc2 because of 11 ... Nfxe4; 12 Nxe4 Nxe4; 13 Bxe4 Bxd4. 11 ... a5; 12 Bb2 a4! ; 13 Rc1 c6; 14 Ba1 ab; 15 ab Qb6; 16 h3 Nfd7! 17 Rb1 Nf8; 18 Kh2 h5! 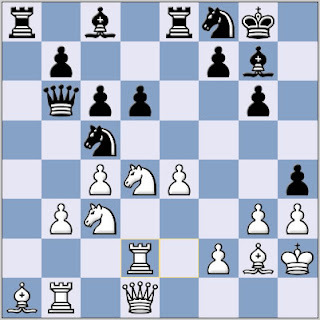 White was planning to strengthen his position in the centre with 19 f4. But Bronstein is alert to his opponent's intentions: after 19 f4 he is ready to start a fight for the initiative on the kingside with 19 ... h4! 20 g4 Nfe6!, when the f-pawn also becomes a weakness. The idea of this strong riposte is that on 23 ... Nxa1 there follows 24 Nd5! and 25 Nf6+. But, once again, Bronstein has foreseen everything. Now it is clear how important it was to advance the pawn to h4. Owing to this pawn it is now not possible to play 24 Qxb3 because of 24 ... hg+ 25 Kh1 Bxh3! 26 Rg1 Bxg2+ 27 Rxg2 Qf1+ 28 Rg1 Qxh3 mate! 24 Ra2 Qxg3+; 25 Kh1 Qxc3; 26 Ra3 Bxh3; 27 Rxb3 Bxg2+; 28 Kxg2 Qxc4; 29 Rd4 Qe6; 30 Rxb7 Ra8! Black inflicts a blow on the enemy king from the queenside. White has no satisfactory defence. On 32 Kg1 there follows 32 ... Qe5! 33 Rd1 Ra3! and then ... Ne6-f4.